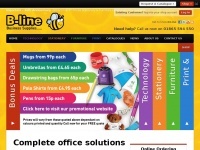 B-Line is one of the UK's leading office products companies. Centrally located in Oxford and Northampton, we carry a wide range of office supplies including technology products, office furniture and stationery, for next day delivery. B-line.co.uk presents an article about a specific topic.